Indulging in decadent, rich food is a weakness of mine. I like to smother things with sauces and cheese and lots of other 'not so good for you' things. But as it goes with most things in life, moderation is key. That's why I try to make sure I also prepare simple and healthy meals for my family. This recipe has just a few fresh ingredients. The bright and sweet flavor from the pineapple balances the earthiness of the garlic and ginger. The flavors are very subtle, so if you're looking for them to be a bit more bold you can sub bottled teriyaki sauce for the soy sauce mixture. Serve these tasty packets over steamed rice and you'll have a well balanced meal you can feel good about. Throwing this one in the mix this week will helps me to feel not so bad about the Spinach Artichoke Alfredo Pizza I'll be indulging in this weekend. Enjoy! Tear off 4 pieces of aluminum foil, about 15 inches long. Spray foil with cooking spray or use non-stick foil. In a large bowl combine chicken, pineapple, peppers and onions. In a small bowl mix together soy sauce, pineapple juice, garlic powder and ground ginger. Pour over chicken mixture and stir to coat. 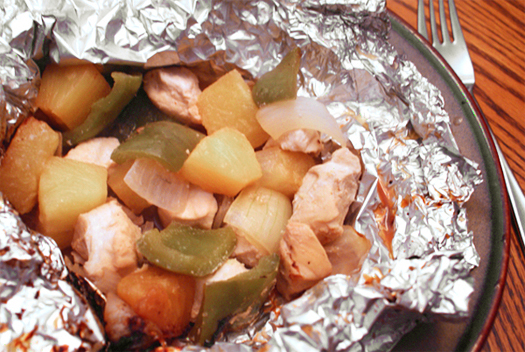 Divide chicken mixture equally onto the four pieces of aluminum foil. Bring the foil together over the chicken and fold down to seal. Fold in the opposite sides of the foil tightly closing the packets so no juices escape. Grill for 5 minutes over medium high heat. Flip packets carefully as to not puncture the foil and grill for 5 more minutes.